The mighty power station that harnessed the power of the Yenisei has also been the site of tragedy. Rising like a mirage above the roiling surface of the Yenisei River, the Sayano-Shushenskaya Dam represents the essential contrast of southern Siberia, an industrial dynamo set within obscure villages and economically challenged towns. It is difficult to express the outsized scale of the dam--the largest in Russia and the ninth-largest in the world. The Yenisei is one of the three great river systems that run through the vast territory of Siberia. The Yenisei, the Ob and the Lena have each played a decisive role in Russia’s Eurasian destiny. From the late 16th to the 20th centuries, these great rivers and their tributaries were primarily arteries of transportation within an enormous trackless space. Beginning in the 20th century, however, the rivers increasingly drew attention as potential sources of hydroelectric power. Soviet planners focused in particular on the Yenisei River basin, which became the center of a comprehensive hydroelectric campaign that transformed the Krasnoyarsk Territory into a major industrial center. In strategic terms, the main purpose was to provide power for a network of energy-intensive aluminum plants in the region. The Yenisei — whose name means “great water” in the local Evenki language-—takes its origins from the merger of the Large and Small Yenisei Rivers at Kyzyl, capital of Russia’s Tuva Republic. From Kyzyl, the Yenisei flows more than 2,000 miles north to the Kara Sea, part of the Arctic Ocean. The Yenisei basin, which includes the Angara River, covers almost a million square miles and is the seventh-largest in the world, but is second in Russia, after the Ob River basin. 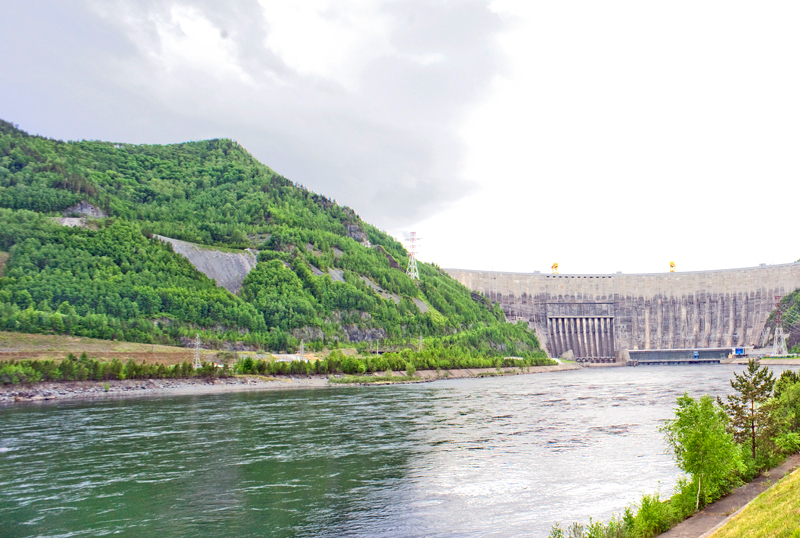 In 1954, work began on the massive Bratsk Hydroelectric Station (or GES, after the Russian abbreviation for “hydroelectric station”) across the Angara River, the main right tributary of the Yenisei. Soon thereafter, work commenced on a series of projects along the Yenisei itself. The first major component arose near the regional capital — the Krasnoyarsk GES. Begun in 1956 and completed in 1972, it is currently the second-most powerful in Russia. The dam is about 100 miles from Abakan, the capital of the Republic of Khakassia in Siberia. You can reach Abakan from Moscow by plane on Aeroflot and S7 Airlines. In the late 1950s, planning began for the even larger Sayano-Shushenskaya GES, situated on the upper (southern) reaches of the Yenisei. In this area, the river is channeled by the Sayan Corridor, a 175-mile stretch through the West Sayan Mountain Range, which gave the dam the first part of it’s name. The second part was derived from the nearby Shushensky region, which is associated with the exile of Vladimir Lenin. The formal designation of the project also includes the name of Peter Neporozhny, hydroelectric engineer, scientist and, for two decades, head of the Soviet Ministry of Energy and Electrification. In 1961, exploration work began at the chosen project site, located between the Karlov Narrows at the village of Cheryomushki near the town of Sayanogorsk in Russia’s Republic of Khakassia. The upper width of the gorge at the projected dam height is nearly 3,000 feet. Construction work began in phases over the next five years. Everything about the Sayano-Shushenskaya GES is gargantuan, beginning with its arch-gravity reinforced-concrete dam, which at 743 feet is the highest in Russia. The dam is 350 feet thick at its base and 80 feet at its crest. The length of the crest, including anchor extensions into the flanking cliffs, is about 3,500 feet. Construction of the dam required over 300 million cubic feet of concrete. The ecological impact included the submersion of thousands of square miles of old-growth forest on the steep, almost inaccessible slopes along the reservoir. Efforts to ameliorate the impact — including effects on the population of snow leopards and sable — led in 1976 to the creation of the Sayano-Shushensky Biosphere Preserve, almost 1,500 square miles in size and containing large stands of valuable Siberian cedars. Because of the size and complexity of the project, construction took decades. The first of 10 power-plant chambers (with turbines and generators) was opened in 1978. The next two turbines came online the following year, and the 10th was completed in 1985. The entire complex, including a visually striking reserve spillway, was finished only in 2000. In 2008, a large monument “To the Conquerors of the Yenisei and the First Builders of the Sayano-Shushenskaya GES” was unveiled to celebrate the 30th anniversary of the operation of the first turbine. Built by the architect Vyacheslav Bukhaev on an observation platform over the Yenisei, the polished red granite monument displays a group of engineers and construction workers cast in bronze by the sculptor Andrey Balashov. Rising ominously above them is a frozen wave symbolizing the waters of the “tamed” Yenisei. For all of the monument’s bravado, difficult times loomed for the Sayano-Shushenskaya complex. After the demise of the Soviet Union in 1991, most of the electricity-generating systems of the country, including the hydroelectric network, were reorganized and partially privatized under the aegis of a power holding company known as Unified Energy Systems of Russia. Subsequent management and financial irregularities led to a series of fundamental reorganizations over a period from 2002 to 2008. The company was finally declared defunct in July 2008. As part of this extended process, the primary hydroelectric systems were transferred in 2004 to a company known as RusHydro. The Sayano-Shushenskaya GES continued to be an essential component in providing expanding energy needs for the region’s gigantic aluminum smelting operations, but during this period, the station’s turbines and related equipment were subjected to unrelenting, colossal pressures exacerbated by a lack of maintenance oversight. On Aug. 17, 2009, a series of events culminated in a catastrophic failure centered on the number 2 power chamber. As a result of accumulated stress on weakened components, the massive number 2 turbine in effect exploded from the immense force of the water flow. A simultaneous failure of backup systems led to a cascade of flooding and collateral damage to the machine room. The ensuing chaos caused the deaths of 75 workers, and the station lost all generating capacity. The Yenisei River was severely polluted by tons of turbine and generator oil. In the wake of such devastation, the arduous process of restoring this critical link in the Siberian power grid began almost immediately. Power chamber number 1 came back into operation at the end of 2011. Three more turbines came online the following year, and the plant was returned to full operation by the end of November 2014. The total amount required for the restoration and modernization of the hydroelectric plant amounted to 41 billion rubles, or around $1 billion in exchange rates at the time. The restoration efforts also entailed improvements to the village of Cheryomushki. The picturesque road north from Cheryomushki along the left bank of the Yenisei winds at the foot of steep hills containing a large marble quarry. A few miles away is the village of Uisky, part of the small town of Mayna. Visible on the hillside above the village is a small white church dedicated to the Seven Sleepers of Ephesus and built in the architectural style of medieval Novgorod. Completed in 2010, this elegiac monument serves as a cemetery chapel and memorial at the site where victims of the 2009 catastrophe are buried. At Uisky, the road passes a renowned trout fishery (fish sold directly to the customer) and turns right to cross a small dam and bridge over the Yenisei into Krasnoyarsk Territory. Immediately on the right is the village of Golubaya, situated on the small, rapid Golubaya River and comprising part of the adjoining village of Sizaya. The dominant architectural monument in Golubaya is the Church of St. Eudoxia, built in 1995-1999 by the Krasnoyarsk architect Areg Demirkhanov. The project began as a chapel supported by Ivan Yarygin, a native of Sizaya and two-time Olympic champion in free-style wrestling. After his death from an automobile accident in 1997, the project was expanded by his family into a church dedicated to the memory of their mother, Eudoxia. Clad in white marble from the local quarry, the church displays a large icon screen on the interior. Sizaya also has a museum devoted to Yarygin. This dramatic landscape in the Sayan Mountains seems defined by its memorials, some heroic and others suffused with sorrow. Indeed, the Sayano-Shushenskaya dam is itself a monument to remarkable ingenuity and determination, yet it is also a reminder of the tenuousness of human control over nature’s power.